It's no secret that I love hosting dinner parties and creating tablescapes. As soon as my friend Ashlee suggested a Friendsgiving dinner, I was dreaming up my place settings and pinning inspiration photos on Pinterest! It's easy to create a beautiful table for dinner, but my goal this year was to incorporate decor that I already owned and not get SO swept up in creating the "perfect" table that I spent hundreds of dollars. Well, mission accomplished! 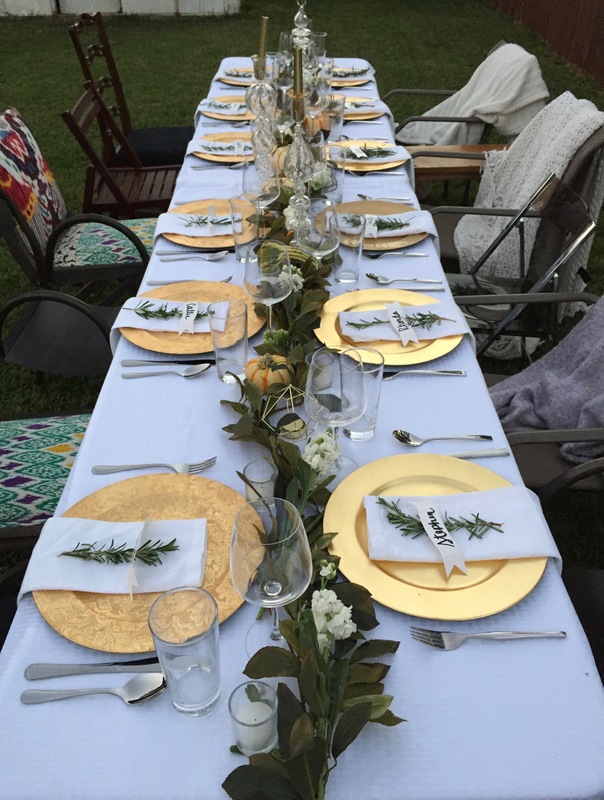 I used items that I had accumulated over the years and added a few small purchases to complete my Friendsgiving tablescape and create an inviting atmosphere in my friend's backyard. This was the largest Friendsgiving I had ever created table decor for, so I did have to purchase an extra tablecloth, and one additional set of white cloth napkins to match the ones I currently owned. This year, I opted to keep things simple and instead of professional calligraphy, I used a chisel tip Sharpie to "callig" my friends' names onto premade placecards that I snagged for $1! My plan was to use a gold paint pen, but I had to improvise on a time crunch right before dinner. My friend, Chris, graciously hosted the meal in his backyard and even cooked his first turkey for our dinner! The other guests (13 total) each brought a side dish or dessert to contribute to the meal. We feasted that night and had so much good food! I was completely impressed by my friends' ability to cook and show up on time to a weeknight Friendsgiving dinner! Friends asked "where did you get all this stuff?!" in reference to the table decor and I had to tell them that some of the candles were on top of my piano, a few of the chairs were from my living room, etc., which gave us all a good laugh! I used 3 faux greenery garlands as the base of my table runner centerpiece; then I layered in fresh white stock flowers and mini pumpkins and gourds (that were already at my house) to add color and texture to the table. I placed 3 tall candelabras in the center of the table, flanked by small white votive candles to brighten up the table when it got dark outside. Gold chargers and white napkins served as my place settings (because I forgot my plates!) with a sprig of fresh rosemary to hold the placecards. Luckily, the plates arrived and Friendsgiving was a success! The most important part of Friendsgiving isn't the table- it's the FRIENDS! (having plates helps too, though) I am so blessed to have a strong community of friends to share this meal with- we laughed, we shared our dreams for the future, and talked late into the night after dinner. I know that many people will never have a group of people surround them like the group that I get to do life with everyday; I am so thankful for them and for this special time in our lives when we are able to enjoy each other's company on a random Tuesday night in November. Happy Thanksgiving, friends! Professional photos by Andy Luten.